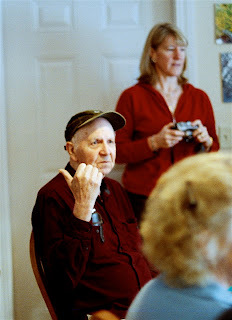 This is Joe the Barber, Queen Bee's dad, on Christmas morning (That's D, sister C's partner, in the background). I don't know what kind of story he's telling but this is a pretty standard look for him. I'm not sure exactly how old he is but he's close to 80 and has come as close to retirement as I think he's able. He goes into the barber shop 2.5 days a week and makes the occasional house call to loyal customers who are no longer able to come to him. For Christmas his kids gave him a new TV, his first in probably 20 years, and he was amazed and pleased and can now see the whole field when the Patriots are playing instead of the whole field minus random pixels missing here and there. It was, as Chili says, the winner gift this year. *Like how I worked the birthday girl into this post, too? Mr. Chili has been researching monitors to buy in lieu of a big screen t.v. He figures that the cable and TiVo boxes have all the stuff necessary to get a picture on the screen, and that paying for a box with a tuner and speakers in it would be a waste of money. He's hoping to get it for the Super Bowl (and I"m hoping he does). Ayuh. That's a winnah gift, alright!